EXECUTIVE EDITOR--AUTOWEEK.COM BOB GRITZINGER: My initial impression of the 2011 Mini Cooper S Countryman All4? It's too big and heavy to wear the Mini badge. After driving? I am stunned at how much fun even a bigger, heavier Mini can be. Working the six-speed manual gearbox does wonders for getting the most out of the available displacement--punching the sport button is mandatory. But where a “normal” Mini relies on front-drive and a superb chassis to wing it around corners like a go-kart, the Countryman employs excellent AWD to send the power to the right places to push the car through corners. Sure, there's more body roll with this tall and hefty Mini, but you can feel the suspension reaching out to keep the rubber in maximum contact with the road despite the upper-body motion. The result is a bigger Mini that is still a blast (and a half, I suppose) to drive, and drive hard. When you really hammer it around a freeway ramp, it feels completely tied down and grippy. Gearing is excellent to hit the right revs for the speed and the tightness of the corner. Steering is spot on. My major complaint: Wind and tire noise are evident, which may not be an issue in a less expensive Mini, but for $33,000, a little better insulation might be in order. After more time in the Countryman, I believe it is improperly named. 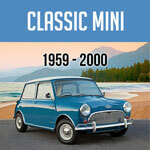 This is the Mini Everyman, because it is the Mini that anyone could live with and love. There's plenty of space, plenty of scoot and plenty of fun here to qualify for Mini citizenship, but you don't have to live with the tight dimensions of the mini-er Mini. When you need to actually carry four people, or some cargo, the bigger Countryman gives you reasonable space for the people or stuff. I could see this becoming the Mini for those who just can't justify the limitations of the diminutive Mini. EDITOR WES RAYNAL: I thought the car was close to a hoot to drive. It's quick enough and still has go-karty handling, though I'm a bit surprised the thing cracks 3,000 pounds on the scale. That's a little hefty. And it's cute, but not nearly as cute a regular Mini. Another thing that surprised me was rear-seat room--there's quite a bit more than I would have guessed. Front-seat room seems about the same as that in a regular Mini to me, with a lot more headroom. The steering might be the best part of the driving experience. It's really quick and accurate. There's quite a bit of body roll, but then I expected that. I also expected the body/chassis to me more rigid, but I blame the Detroit potholes, at least in part. Overall, this Countryman is a fun little(ish) scooter. EXECUTIVE EDITOR ROGER HART: This was my first time in the Countryman and overall, I enjoyed the driving experience. It's tall and there is certainly more body roll than you would expect in anything wearing a Mini badge. It's certainly not as tossable into corners as a base Mini. But the biggest disappointment for me was the suspension. In bumpy corners, the car just bounces, rather than the suspension absorbing the energy and keeping it from being transferred throughout the car. Is this because of the size or because of the AWD system? Not sure, but even in a straight line, the car has a different sort of feel on rough surfaces. I also was surprised by the large back-seat area, with plenty of legroom. And the engine and the six-speed manual seem perfectly mated, although I had some problems with the clutch and throttle in getting the thing going. I thought at first it was because of the engine being cold, but then later, I had to really pick the revs up. I don't like the lack of a telescoping steering column. Overall, I came away liking the Countryman more for its differences from the Mini rather than disliking it for not being more like a base Mini. This could easily be a family's main ride--at least until the youngsters start approaching those teenage years. ASSOCIATE EDITOR JONATHAN WONG: Wow, talk about a mondo Mini. This thing is big, right down to the giant Mini badge on the rear hatch. It's not a stretch to assume that some Mini driving traits would be lost with the bigger dimensions, added weight and all-wheel drive. But I was shocked at how well the Countryman retains much of the fun driving spirit we've come to expect from the company. Of course, the turbocharged engine in the S model and the six-speed manual transmission play a big part here. We haven't driven a naturally aspirated version here in Detroit yet, but based off the spec sheet, it doesn't sound like much of a thrill ride. You would be down 60 hp and 63 lb-ft of torque. 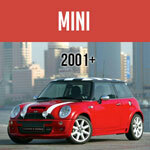 And Mini says hitting 60 mph from a standstill takes 9.8 seconds, which doesn't sound very fun to me. This is while the turbo all-wheel drive reaches 60 mph in 7.3 seconds, which is much better. Another thing worth noting is where the power is available in the turbocharged I4. Peak torque of 177 lb-ft is available from just 1,600 to 5,000 rpm, which explains the car's decent spring in its first step. Considering the size and the higher ride height, the Countryman is a fine handler. There is roll through corners and noticeable dive under braking, but strangely, the ride does get a little rough over our broken surface streets. For that, I'll copy Raynal for blaming our poor roads more so than the car. The overall experience certainly isn't going to match that of the smaller Cooper S hardtop, but for something in a still relatively small package with ample seating for four passengers, this scores high on the fun-to-drive scale. And look at the back seat! It is indeed very spacious with good legroom. Steering is Mini-quick and responsive, and the brakes easily scrub off speed when called on with good pedal feel. True, there's a fair amount of wind and tire noise from the Goodyear rubber that was a little disappointing, but that should easily be remedied with additional sound deadening. However, there was one thing that did drive me nuts--the outside rearview mirrors. They are mounted way too low, which isn't a problem for the driver's side, but on the passenger side, the beltline covers up roughly the bottom quarter of the mirror. Most of the mirror is still in view, but I found it to be annoying to not have the entire thing in full view. ASSISTANT ART DIRECTOR CHERYL L. BLAHNIK: This Countryman and an old Mini Cooper coupe were parked next to each other in the parking lot the other day, and the differences couldn't be clearer. The Countryman looks like a bloated clone of the original. The one thing that annoyed me the most on the exterior was the giant Mini logo on the back. The car's added dimensions are also apparent in the interior, which is roomier with usable back seats. The ambiance of the interior still screams Mini with the giant speedometer in the center and toggle-switch controls. The seats are supportive, and legroom in the front is good. The six-speed shifter is still a delight to use, which I'm ever thankful for. Overall, this bigger Mini is a fun ride with the added bonus of AWD to make it attractive to a broader audience.